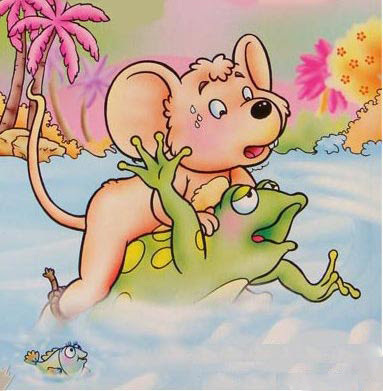 This is The Frog And The Mouse Fable Story for kids. Once upon a time, a mouse and a frog were close friends. The frog often visited the mouse at his home and they both shared the food and provisions the mouse had stocked in abundance. One day, the frog invited the mouse to his house. “Dear Mouse, I come to your house all the time. Now, I invite you to mine!” “I would love to my dear friend,” the mouse replied, “but your house is across the stream. I don’t know how to swim and I am afraid I will drown.” You may also like to read, The Town Mouse And The Country Mouse. “Don’t worry, I have a plan. You can climb on my back and I can tie you to me with a strong blade of grass. That way, you will be safe to cross the stream,” said the frog. To this, the mouse immediately agreed and they set forth. Halfway across the steam, however, the frog started to get wicked thoughts. “If I were to let the mouse drown, I can get all his food stock and never have to worry about being hungry for a long, long time!” the frog thought. So, the wicked frog dive for the bottom of the stream. You may also like to read, The Frogs Who Desired A King. The mouse realizing too late the betrayal of the frog started to cry for help. “Help me! Help me!” cried the mouse. A hawk flying above the stream saw the scene and swooped down upon the mouse. The hawk picked him up with its beak and started to fly high into the sky. The frog tied to the mouse was also taken away. The frog realized his mistake. In his greed to get more food, he had not only his good friend, the mouse down but also put his own life into danger. Also, read Hawk And The Nightingale. MORAL OF THE FABLE STORY: WE MUST NOT TRY TO TAKE AWAY THE THINGS WHICH IS NOT OURS.